Welcome!!! Are you ready for another Scribbles Designs Challenge? I hope you are cause today, we have exciting news about some changes that have been made to the monthly challenge rules. NOW, you can enter the monthly challenge even if you don't have a Scribbles Designs image. However, a freebie is offered to you; furthermore, if you do use a Scribbles Designs image, then you have UNLIMITED entries. If you do not use a Scribbles Designs image, then we ask that you please limit your entry to only 3. For my card today, I am using Flower 6. I LOVE the think black outline. It really makes it pop out on any background. Or by itself as the focal point, non colored. See I have some ideas for this beauty. 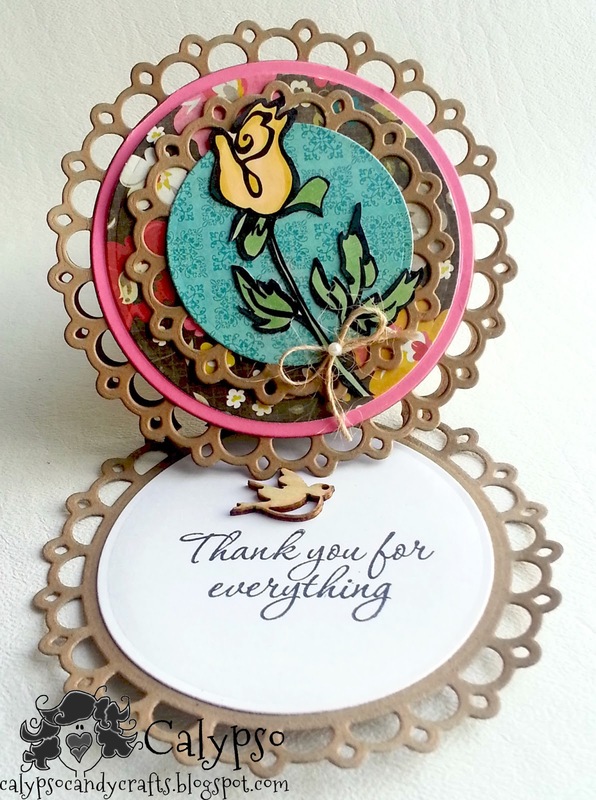 My easel card was created using Spellbinders dies. As you can see my top is a little top heavy, because of all the layering...LOL. The sentiment is from a Hero Arts stamp set. The last 3 weeks have been sort of busy with lots of unexpected events taking place and Sandy, the owner/artist of Scibbles Designs has been an amazing fiend to me. She says the right things at the right time and really sent a smile to my heart. So when I was making this card earlier, I really had her in mind. Sometimes the people that really matter most are so far away and it is really hard to tell them how much you appreciate them. So this card is for you Sandy. Thank you for being who you are, doing what you do and for giving me a chance to be in your life. So what that said, come on over to the Scribbles Designs Challenge Blog and check out the AMAZING creations by the design team. The cards are to die for...My card is nothing in comparison to theirs. Stunningly beautiful my sweet friend! Thank you for the card! It is so incredibly beautiful! I am truly blessed to have you in MY life! Your card is nothing????? Oh my! Oh my! I think you hit this out of the park! And I am so glad you are with me in the SD corner! This card is gorgeous!!! Great job! Such a beautiful card and I love the shape of it. Beautiful tribute card to Sandy as well. She is an amazing woman, a wonderful artist, and a pretty great 'boss' to boot. Hope things are better with the little one.